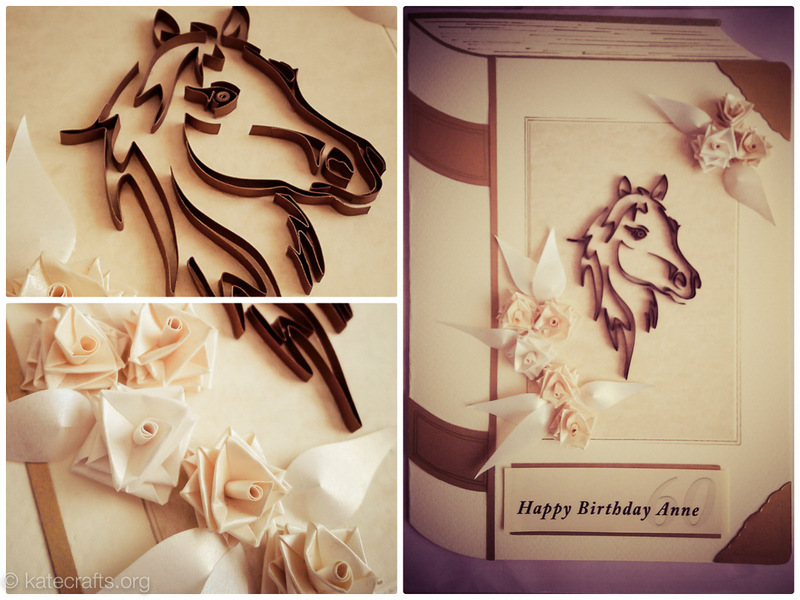 This 60th birthday card was made for a lady that has a passion for horses and loves to read books. It was a straightforward but demanding project, a card in the shape of a book with a horse on the cover. You will ask “why demanding?”, but the process to make a horse head shape is time-consuming and requires a lot of precision. The end result can surprise and the card will stand out from the crowd. Step 1. Start with cutting out the shape of a book out of the cream card as a background. The book cover and pages effect can be done using a ruler and gold ink pen. Add few extra paper pieces using gold paper for the side and corners of the book (see below). Step 2. Choose and print the chosen image of the horse. Place the printed image under the ivory paper and place it on the light box, using the light to outline the shape of the horse. One by one take brown paper strips and start building a shape. Best is to start from inside (like an eye) and go towards the edges. Make a simple line and glue it before you proceed to make a bend. Continue with glueing for each segment to build a shape. Keep in mind that you will use few strips of paper with different length but do not worry about it – you will cut the unused paper once you have each segment done. Step 3. Decorate the card by making roses (video tutorial here). Step 4. Last but not least, add few leaves and glue them around the roses (detailed tutorial coming soon). Next Post So what do I need to make a fancy card… Quilling tools.